The Independent Corrupt Practices and Other Related Offences Commission (ICPC), is poised to stem the tide of vote buying in the country as a way of ensuring that credible leaders emerge through elections in the three-tiers of government. The Chairman of ICPC, Professor Bolaji Owasanoye, disclosed this at a media parley held at the Commission’s Headquarters recently, when he said that ICPC, through its training and research arm, the Anti- Corruption Academy of Nigeria (ACAN) would organise a national dialogue towards eradicating electoral malpractices with focus on vote buying. Owasanoye who was represented at the event by Hon. Member Mrs. Olubukola Balogun, noted that the national dialogue was an effective preventive strategy designed to bring topical anti-corruption issues to the fore of national discourse. He explained that the dialogue would engender discussions that would aid the formulation or modification of policies and legislations on topical matters; focus on matters that require urgent attention and create an avenue to discuss key issues; share points of view and try to find common grounds, agreement or consensus on the policy matter in focus in order to achieve sustainable development. The ICPC Boss said that the dialogue, coming up on the 16th of April 2019, would be the first in the series for the year, meanwhile other issues had been lined up and would be disclosed in due course. In his remarks, the provost of ACAN, Professor Sola Akinrinade, while speaking on the aim of the session said that it was very apt as a lot of concerns have been raised on the just conducted 2019 elections, and the matters associated with the elections would continue to reverberate until the next elections in 2023. 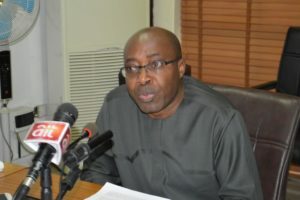 He went further to say that there was the need to develop a strategy that would address the foundational issues relating to vote buying, stressing that the session would require stakeholders to carry out activities which aim to “strengthen the electoral process across the Federal, State and Local Government Levels to engender public confidence”. “More credible electoral culture” he said, is the ultimate goal. Also speaking at the meeting, Director Public Enlightenment, Mrs. Rasheedat Okoduwa, mni, said that the overall aim of preventive strategies was to create a Nigeria where things work. She added that the fight against corruption must focus more on the ripple effects of corruption in the development of the Nigerian economy, while encouraging the media to continue to support ICPC in the anti- corruption fight. Stakeholders and other participants expected at the Dialogue, which is to be chaired by the Chairman, Independent National Electoral Commission, INEC, Prof. Mahmood Yakubu, include key officials from the executive and legislative arms of government; representatives of political parties; anti-corruption and law enforcement agencies; Faith-based and Civil Society Organisations; development partners; organised labour; academia and others.